This article is about Diddy Kong's appearance in Super Smash Bros. Brawl. For other uses, see Diddy Kong. Diddy Kong (ディディーコング, Diddy Kong), commonly known as just Diddy, is a character for Super Smash Bros. Brawl. He is unique, distinct among the cast for his charm and gaiety. 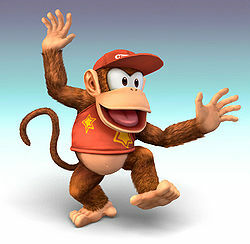 Unlike in most Donkey Kong games and Mario spin-offs, where Diddy Kong has a cartoonish voice, Brawl has him using a high-pitched chimpanzee-like voice. He is also the first playable character to be introduced from the Donkey Kong universe since the original game. He currently ranks 4th on the tier list (the highest-ranked of any Mario character including sub-series characters). This is mainly because of his ability to throw Banana Peels that give him great control of the ground and great setup and damage-racking potential (by attacking opponents that have slipped on them), as well as providing good defense, making them one of the best projectiles in the game, giving him a very strong control of the ground. Additionally, he has quick attack speed, good mobility, a solid down aerial meteor smash, good grab range, and powerful throws, which aid in his ability to control the stage. However, his primary recovery move, Rocketbarrel Boost, travels in a predictable fashion, is easily edgehogged, and can be stopped by stage lips. Additionally, his few KO moves, while fast and reliable when fresh, stale quickly and are largely dependent on his Banana Peels for a setup. Diddy Kong has excellent matchups, having only three slightly unfavorable, and has very strong tournament results. Diddy Kong is a quick, middleweight character. He is capable of wall clinging and crawling. Many of his attacks have good speed and have decent power to back them. His KO power is low due to his few KO moves and a general weakness in his smashes, which stale very quickly if he uses them too much for racking damage, which forces a reliance on meteor smashes for early KOs. Diddy also has two projectiles: his Peanut Popgun and Banana Peels. Peanut Popgun, while not particularly strong, is a decent mid-range move for racking up easy damage. In comparison, his Banana Peels, which have the property of tripping opponents, form a much more integral part of his metagame, as they combo well into his other moves, and allow him to setup KOs. The glide toss option provided by the Banana Peels is invaluable, as it allows Diddy to rapidly approach and retreat. If an opponent is tripped by a thrown Banana Peel, Diddy can follow up with another glide tossed Banana to continue the combo, and end with a down or forward smash for a KO. In conjunction with his quick dash attack, large grab range, and powerful throws, Bananas provide Diddy with excellent ground options and stage control. Banana Peels can also help him escape certain chaingrabs, such as King Dedede's, and certain grab releases. However, as Banana Peels are items, they can be used against Diddy even by opponents without reflectors. Diddy's other special moves Monkey Flip and Rocketbarrel Boost contributes to his above average recovery. Besides being a useful move to rack up damage, Monkey Flip can be used as a meteor smash if Diddy uses its grab option in midair (it can also be used as a sacrificial KO, but this is not useful because the meteor smash is much more reliable and safer); it also can be used to gain horizontal distance in tandem with Rocketbarrel Boost to make up for Diddy's poor air speed. Diddy will not be able to use Rocketbarrel Boost if he uses Monkey Flip's attack option in midair, but he will retain his midair jump. The former move provides great vertical distance if sufficiently charged, but it leaves Diddy vulnerable while charging, and he needs to charge to move left or right at all. Potential edgeguarders will still have to watch out for the meteor hitbox on the bottom of Rocketbarrel Boost, as well as the rocketbarrels themselves, which function as powerful explosive projectiles if the attack is interrupted after releasing the charge. Diddy's barrel jump can also improve his recovery, acting like a second midair jump while Rocketbarrel Boost can still be used. Diddy possesses a decent aerial game. His forward aerial has above average knockback and surprising range, making it a viable KO move and useful for edgeguarding, though it has the most landing lag out of all of his aerials. His back aerial, up aerial, and neutral aerial are all relatively fast, with the former being another decent option for edgeguarding and a very quick way to grab bananas in midair, though the latter is rarely used in competitive play. His down aerial is a solid meteor smash (similar to Wolf's down aerial) with some startup lag. In summary, Diddy Kong is a fast, medium-weight character with agile moves that combo well from his versatile Banana Peels. His KO power is poor, forcing a reliance on racking up a very large amount damage in order to KO, and he generally relies on his bananas to set up KOs. On counterpick stages, his Banana Peels are not as useful as on neutral stages, making it more difficult for a Diddy player to win a set if they do not win the first match. For a more detailed information regarding Diddy Kong's moveset and attack hitboxes, see this page. 3% Diddy Kong slaps forward twice, turns around to quickly kick the foe, and proceeds to repeatedly whip them with his tail. The first hit can set-up a grab if jab-cancelled or even a buffered down smash. 11% (fists), 9% (arms), 8% (body) Diddy Kong leans to the side and thrusts both of his arms forward in a double punch. This attack can be angled upwards or downwards. When angled up, it can KO at 161% from the center of Final Destination. 7% Diddy Kong swats in the air above him with a slap. This move can be used to juggle at low percents and can KO at 159%. 7% Diddy Kong, claps forward while crouching. Extremely useful for racking up damage at low percentages. 3% (hit 1), 2% (hit 2), 4% (hit 3) Diddy Kong performs a cartwheel from Donkey Kong Country. The first hit of the move spikes opponents, making it easier to land all three hits. 5% (hit 1), 13% (hit 2) Diddy Kong spins and punches forward, followed by a second punch. The first hit deals no knockback, which makes it easier to land the second hit. The second hit deals shield damage. KOs at 122% when uncharged and 79% when fully charged. 5% (hits 1-2), 6% (hit 3) Diddy Kong hops a little and does a sort of cartwheel, hitting three times with extremely low knockback (weakest up smash in the game in terms of knockback). Fills in combos, can rack up damage easily. 16% (front), 12% (back) Diddy Kong performs a sweeping kick. It has less knockback than his forward smash, but it's still his most reliable smash attack. KOs at 126% when uncharged and 85% when fully charged. 6% Diddy Kong does an aerial cartwheel similar to his dash attack. Can KO at around 170% if used near the upper blast line. 14% (clean), 11% (late) Diddy Kong kicks both feet forward while spinning, similar to Mario and Luigi's old forward aerial in Super Smash Bros.. KOs Mario at 142% from the center of Final Destination. 9% Diddy Kong thrusts his leg backward and spins it behind him. Good knockback, though it won't gain KO power until past 170%. 11% Diddy Kong does an overhead flip kick. Fairly fast with decent knockback, and it can KO at 162%. 12% Diddy Kong swings both arms downward in a double axe-handle punch. A strong meteor smash. — Diddy Kong grabs his opponent with both of his hands. 2% Diddy Kong headbutts his target, angled from the side of his body. 11% Diddy Kong tosses his opponent forwards. The throw is based on Diddy Kong's barrel toss animation from "Donkey Kong Country". 10% Diddy Kong tosses his opponent backward, very similar to his f-throw in that it is useful for getting opponents offstage. 4% (hit 1), 5% (throw) Diddy Kong throws his opponent up and handstand kicks them. 9% Diddy Kong performs a leapfrog-like manoeuvre and throws the opponent underneath him. Has fair backwards knockback. Has little utility and almost no follow-ups available. 6% Diddy Kong gets up and slaps both sides. 6% Diddy Kong gets up and kicks both sides. 5% Diddy Kong gets up and kicks both sides. 8% (tail base), 6% (tail tip) Diddy Kong quickly gets up and does a spinning tail slap. 10% Diddy Kong slowly gets up and sticks his left foot out. Peanut Popgun 3-18% Diddy Kong pulls out his peanut popgun and fires a peanut. Can be charged, but if charged for too long the popgun will explode, and will stun Diddy Kong for a second. Monkey Flip 14% (kick hip), 12% (kick knee), 10% (kick foot), 5% (grab attack hit 1), 5% (grab attack hit 2), 5% (jump attack hit 1), 5% (jump attack hit 2), 2% (release) Diddy Kong performs a sideways hop that has the potential to launch Diddy onto an opponent's face if timed correctly. Can perform a flying kick with another button press. Can also be used to gain some extra recovery distance. Rocketbarrel Boost 10% (launch clean), 8% (launch late), 1-3% (rocketbarrels), 18% (rocketbarrels explosion) Diddy Kong charges his rocketbarrels from Donkey Kong 64 in a powerful attack. Can potentially fly very far and very fast, but hitting a surface will make Diddy Kong lose his rocketbarrels and will fall helplessly. Diddy Kong will take 5% damage for hitting a surface. Banana Peel 4-6% (banana) Diddy Kong tosses a Banana Peel into the air to have it fall onto the ground. Opponents who touch the peel will slip and trip. Up to two banana peels can be thrown at a time. Rocketbarrel Barrage 8% (peanuts), 15% (peanuts explosion), 18% (contact), 20% (ending explosion) Diddy Kong flies around on his rocketbarrels, shooting peanuts everywhere. Puts Diddy Kong into a helpless state when ended in the air. Breaks out of a DK Barrel and claps his hands above him. Up taunt: Throws his hat into the air, which lands on his head. This is a reference to his from Donkey Kong Country, after he defeats a boss or wins in a Bonus Level. Side taunt: Does a playful fighter's stance and cackles threateningly showing his teeth. Down taunt: Claps his hands four times, changing feet as he does so. Scratches his rump and shakes his fur. Taps the ground and makes a short giggle. A peaceful flourish originating from Donkey Kong Country that played whenever a Kong defeated a boss or completed a Bonus Level. Up: Spins with his Rocket Barrels, then faces the screen, dancing with his hands on his head and chin. Left: Shoots the air with his Peanut Popguns, rolls towards the camera, and shoots at the camera. Right: Does a small dance, then holds still in a breakdance-like pose, clapping his feet together. Diddy Kong has very strong matchups against the entire cast. According to the SmashBoards Matchup Chart, he has the seventh higest unweighted and weighted rank. He is soft countered by three characters, has 6 even matchups, soft counters 15 characters, counters 9, and hard counters 2. Diddy's bananas let him dominate the neutral game, and allow him to rack up damage very quickly (because the bananas do 4% damage every time they are thrown and set up into many very damaging moves). His banana peels shut down ground based characters that lack the tools to fight the bananas, such as Pikachu and King Dedede. He has has powerful aerials that give him some air prowess and he is able to beat characters like Lucario this way. Diddy Kong has trouble from opposing campers, like Snake and Falco, as their grenades and lasers respectively shut down his neutral game. ADHD - One of the most nationally dominant players since Brawl's inception, famed as one of Mew2King and ZeRo's most difficult opponents. cyve - The best Diddy main and one of the best players in Europe. Felix - Although he rarely traveled, he became known for his 3rd place finish at MLG Raleigh 2010. Gnes - A nationally dominant player in his prime, won the largest-ever Brawl prize check and the largest in the entire Smash series at the time at MLG Dallas 2010 ($12,500). Luigi player - A top Diddy player in Europe. Nagahari - One of the best Diddy players in Japan. NinjaLink - Famed for being the first player to defeat Mew2King in a tournament set. Suinoko - One of the best Diddy players in Japan. Zinoto - A top Midwestern Diddy player with a 5th place finish at SKTAR 2, famed for his usage of banana infinites. Diddy Kong was initially a high tier character, ranked 11th on the first tier list (September 2008). However, Diddy Kong players such as NinjaLink and ADHD showed how powerful his Banana Peels were, utilizing them to create damage-racking combos, defense, and stage control, bringing Diddy Kong into the top tiers, with him rising to 7th on the second tier list (January 2009), 5th on the third (June 2009), then 3rd on the fourth and fifth lists before surpassing long-time #2 character Snake by the sixth tier list (July 2011). Though Olimar and the Ice Climbers have since surpassed him, he still remains at 4th place on the eighth (current) tier list, as of April 2013. When Donkey Kong has three Bullet Bills fired at him by the vehicle escaping with his banana hoard, Diddy Kong leaps from behind Donkey Kong and unleashes his Peanut Popguns onto the Bullet Bills, destroying them. He then joins Donkey Kong in pursuit of their stolen bananas. At one point, after getting their bananas, they encounter Bowser, who aims the Dark Cannon at the two. Donkey Kong, realizing what is about to happen, then Giant Punches Diddy Kong, sending him flying away and star KO'd (but he didn't turn into a trophy as Mario and Luigi did). Donkey Kong is shot instead and captured. Then, Diddy Kong comes out of a forest into The Lake. When he gets to the lake where a crashed Arwing is seen, Rayquaza comes out of the water and grabs Diddy Kong. Then Fox jumps out of the Arwing which is now on fire due to an attack from Rayquaza. Fox uses his Fox Illusion and Reflector to send Rayquaza back into the lake and save Diddy Kong. Fox then makes a hand signal for Diddy to come with him to fight Rayquaza until it faints. After Rayquaza's defeat, Fox begins to leave, but Diddy drags him along to help rescue DK. They battle a Shadow bug clone of Bowser, but upon defeating it, the real Bowser attacks them and Fox flees, dragging Diddy to safety. Diddy Kong in The Subspace Emissary. Later, Fox and Diddy get ambushed by Bowser again, who fires a shot at both of them from his Dark Cannon. Diddy is hit and cloned by Shadow bugs, while Fox dodges the shot. Falco arrives just in time and destroys the Dark Cannon, but Bowser gets away in his Koopa Clown Car while the Shadow bug Diddy grows several times its normal size. Fox revives Diddy, who is shocked at what has happened. Diddy Kong and the two Star Fox pilots then fight the Giant Shadow bug Diddy Kong Clone. After the fight, Diddy drags Falco along with him and Fox as they continue through the jungle. Eventually they see Donkey Kong's trophy on a ship in chains. Diddy is mad at this as he, Fox and Falco board the Great Fox. After, Diddy Kong is ejected out of Falco's Arwing and shoots peanuts at the Primids on the skiff that has DK's trophy on it. He lands on the skiff while Captain Falcon and Olimar jump to the aid of the little chimp. They revive Donkey, then the Kongs and Captains fight a horde of Primids on the little platform. After they have defeated them, Diddy and Donkey Kong do a little dance as Captain Falcon and Olimar watch. As Falco gives a thumbs-up to Diddy, Diddy waves "thank-you". The four then head into the Subspace Bomb Factory. Diddy, Olimar, Donkey Kong, and Captain Falcon then attempt to infiltrate the Bomb Factory where they fight their way through various armies of Primids, R.O.B. units, and other enemies, they reach where all the bombs are and where the Ancient Minister is standing in melancholy and coincidentally meeting Samus & Pikachu there, where they earlier entered the Bomb Factory another way. After meeting up with Samus and Pikachu, Diddy Kong tries to stop the R.O.B. Squad members who are setting off Subspace Bombs. He shrieks at R.O.B. to do something, but R.O.B. just slumps in sadness. Captain Falcon calls his Falcon Flyer to escape the doomed factory. They all pile into the ship while Meta Ridley appears. Diddy can be chosen to fight this boss. After Meta Ridley is defeated, Diddy helps the heroes as the continue their journey into Subspace. At the entrance to Subspace all the characters (except Wario, King Dedede, Bowser, Luigi, Ness, Ganondorf, Sonic and, to a lesser extent, Wolf, Toon Link and Jigglypuff) are all preparing to invade the subspace. After Ganondorf and Master Hand are defeated by Tabuu, Diddy and the rest of the heroes catch a glimpse of the evil power among them. In a single blow Tabuu defeats all of the characters and turned them into trophies. He is later revived by Kirby, Ness, King Dedede and Luigi and joins them to defeat Tabuu, with help from Sonic. After Tabuu's defeat, the World Of Trophies returns to its original place (except for The Isle Of The Ancients, the huge Subspace explosion combined by the huge number of Subspace Bombs has taken it beyond repair). These stickers can either only be used by Diddy, or by a select few who include him. Event 7: Diddy Kong Panic: The player controls Donkey Kong and must defeat 15 tiny Diddy Kongs on Mario Circuit. Event 9: The Monster Beneath the Earth: Ike must defeat two Diddy Kongs before the reaching the underground section of Castle Siege. Failing to do so makes the player also face a giant Donkey Kong. Event 20: All-Star Battle x1: Diddy Kong is one of the eight opponents fought in this event along with Wario, Meta Knight, Pit, Zero Suit Samus, Olimar, Lucas, and the Pokémon Trainer. Event 22: Monkeys Unite: The player controls Diddy Kong, who is aided by a giant Donkey Kong, and must defeat Sheik and Lucario on Rumble Falls. Co-Op Event 4: The DK Tag Calamity: Both Donkey Kong and Diddy Kong are tiny and must defeat one Donkey Kong and four Diddy Kongs on Mario Circuit. Diddy Kong's main and Final Smash trophies can be obtained by clearing Classic Mode and All-Star mode respectively with Diddy Kong. Donkey Kong's little buddy. He's famous for his quickness and his long tail. He usually plays second banana to DK, but he teamed up with his girlfriend, Dixie, to rescue DK when he got captured. He's spent some time playing music and competing in races, and he's also an expert at using barrels. Diddy Kong's Final Smash. Equipping his rocketbarrels and dual peanut popguns, Diddy can fly around attacking opponents in rapid-fire fashion. He can tilt the barrel jets left or right to control his flight and shoot peanuts straight down, too. This is a technique that tests one's ability to control both movement and attack direction. Diddy Kong, Captain Falcon, Ike, King Dedede and Olimar are the only characters who use a Final Smash in the Subspace Emissary (when he attacks the skiff carrying Donkey Kong's trophy after ejecting from Falco's Arwing). He is one of the few characters (the others being Pokémon Trainer, Ice Climbers and Jigglypuff) to have a "Defeated/No Contest" pose different from the traditional hand clapping. Instead, in a reference to his defeated pose from Donkey Kong Country, he removes his cap and shakes his head while scratching the back of his scalp. However, he has a "Defeated/No Contest" pose that has him clap for the winner in the next game. In the Subspace Emissary, the Giant False Diddy Kong uses his third costume (which resembles Dixie Kong), unlike the other false characters which have their neutral colors. In the Subspace Emissary, the peanut shells fired from the Peanut Popgun do not release edible peanuts upon breaking open unless the player shoots the peanuts at jet bursts of flame. Diddy Kong's voice borrows some sound clips from Ukiki in Super Mario 64. Diddy Kong, Samus, Fox, Pikachu and Lucas are the only characters in the Subspace Emissary to fight more than two bosses (excluding boss recreations in The Great Maze). Diddy Kong can be chosen to fight Rayquaza at The Lake, Meta Ridley at The Subspace Bomb Factory (Part II), and Tabuu in the final battle at Tabuu's Residence. Diddy Kong's inclusion marks the Donkey Kong universe the first sub-universe to introduce another playable character. Diddy Kong's page at Smash Bros DOJO!! This page was last edited on April 21, 2019, at 15:18.